Ok, hand up…I did something stupid. It is not the first time, and it won’t be the last. Of course he is correct. Gronk was not even drafted until 2010! (I think I am still traumatized by losing the ’07 Bowl). 2011: Ankle njury occurs against Baltimore in the AFC Championship game. Pats lose to the Giants in the SuperBowl. Gronk plays in that game, although he is clearly limited, basically used as a decoy. 2012: Arm gets broken on the field-goal unit mid-season. 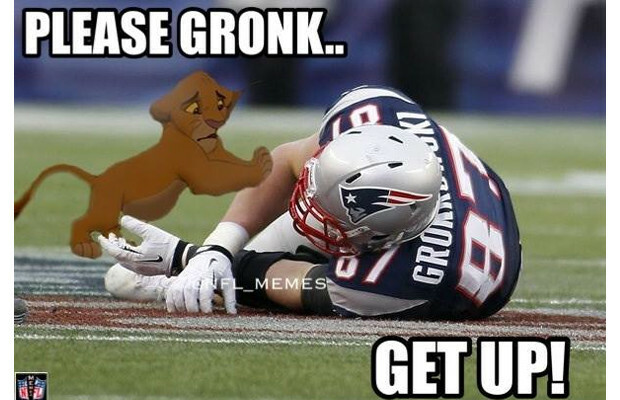 Gronk comes back and re-injures the arm in the playoffs. Pats lose in the AFC championship game to the Ravens 28-13. 2013: ACL gets snapped in half by TJ Ward on a seam route mid-season. Gronk misses the rest of the way and the Pats lose to Denver in the AFC Championship game 26-16. 2014: Gronk is healthy all season, we win the Super Bowl. 2015: A helmet to the knee mid-season took Gronk out for a little, but he was there when it mattered. Patriots lose in Denver 20-18, but Gronk kept us in that game. 2016: Earl Thomas collapses his chest cavity. We win the Super Bowl anyway. I dunno how fair it is, but I think there are at least two more rings for the Patriots if Gronk is available full time.